Hello all! Alison here to share our Pinworthy choices with you from last month's Words and Music challenge. Thank you so much to everybody who joined in. As always, it was fantastic to see what you were inspired to create. 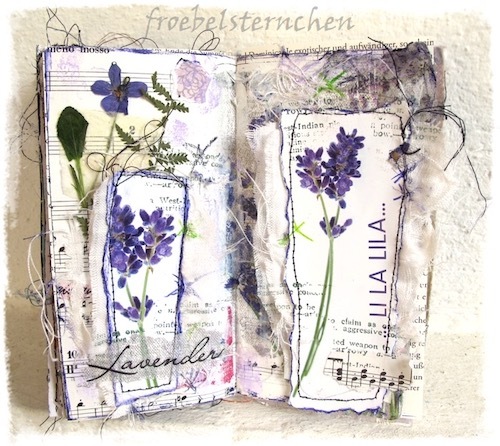 Look at the lovely delicate layers in this page spread Susi created, inspired by the song Lavender's Blue. The manuscript music, stitching detail and real flowers all add to the magic. 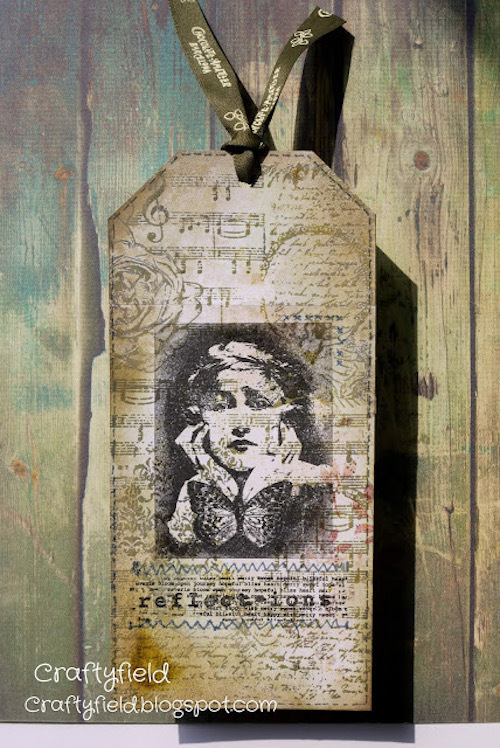 Christine found the perfect image to illustrate her chosen song, Reflections. Doesn't she look as though she's gazing into a mirror? And surrounded by music as she gazes. 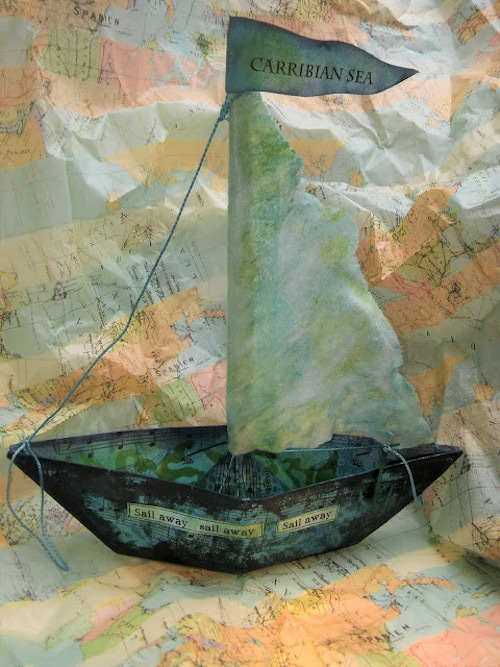 Amanda's wonderful model boat captures the romance and perfect dreamy ocean blues of Enya's Caribbean Blue... Sail away, sail away indeed! Congratulations to all three of you. Your Pinworthy badges will be on their way to you shortly. Thank you again to all our fabulous participants in May. We hope you'll come along and join in with our Stencil It! challenge this month too. Thanks for stopping by today, and we hope to see you again on this Vintage Journey somewhere down the road. Congrats to all three - the tags are beautiful, and that boat is amazing! Well done to all! Congratulations Susi, Christine and Amanda on being our chosen pinworthy winners. Your 'Words and Music' projects are all fabulous and they will be pinned to our relevant Pinterest board right away . Thank you for sharing your creativity with us. Big congrats to Susi, Christine and Amanda! Such wonderful and creative projects from you all! Fabulous work ladies and thanks so much for sharing your creativity with us!! So pleased you liked my tag! Congratulations to my fellow Pinworthies, both are original as well as beautiful! So pleased you liked my spread! Thank you yo much and congrats to Christine and Amanda - amazing pieces! Congratulations ladies!! Each a beautiful piece of musical artwork! I saw Susi's spread over on her blog and it is just wonderful!